Alabama is probably not the first place Chicagoans would consider for a winter getaway. With its Gulf of Mexico shoreline, Alabama is warm as Florida, yes, but it seems a slightly off-center vacation destination…which makes it just right for us. Gulf Shores and nearby Orange Beach on the Alabama coast have lots of white-sand beaches and a load of excellent seafood. After the BP oil spill, there was understandable concern about seafood safety; now, with strong food-safety regulations in place, there’s incredible seafood coming out of Alabamian waters that’s simply unavailable in Chicago. Royal Reds. Long considered by-catch, Royal Reds were once a largely unwanted crustacean that just happened to get mixed in with the shrimp that fisherman were actually fishing for. Now, these once-unwanted shrimp are rare and treasured. More tender and perhaps just a little sweeter than other types of Gulf shrimp, Royal Reds are not always easy to find even at Gulf restaurants. 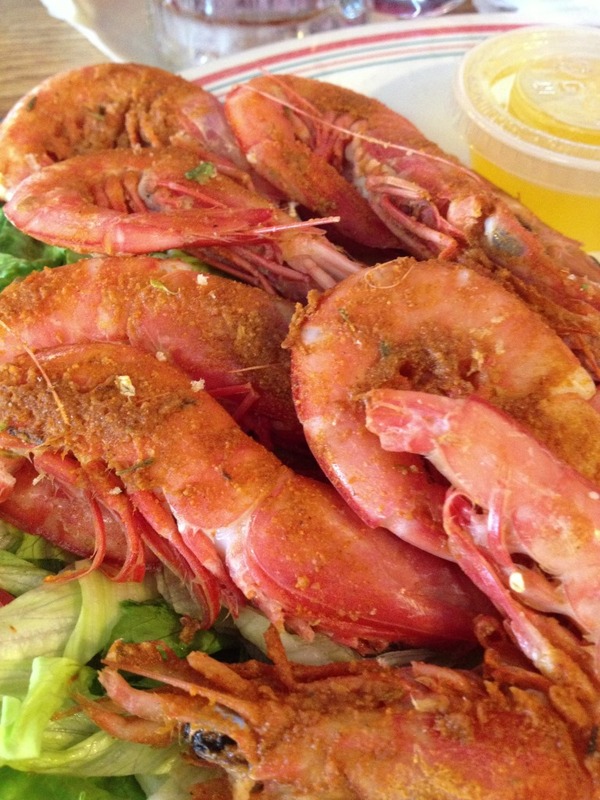 We’d heard about Royal Reds at King Neptune’s (1137 Gulf Shores Parkway, Gulf Shores), and it’s there we had them boiled and sprinkled with Old Bay’s: delicate, flavorful and very red. Black Grouper. Red Grouper you can find almost anywhere: it’s one of the most popular fish in the Gulf. Black Grouper, however, is the denser, meatier deep water variety of this fish. Like Royal Reds, Black Grouper was once considered unwanted by-catch. We had it broiled at Bill’s By the Beach (300 West Beach Boulevard, Gulf Shores), and although it’s allegedly not uncommon in this part of the world, we didn’t see much Black Grouper during our stay. 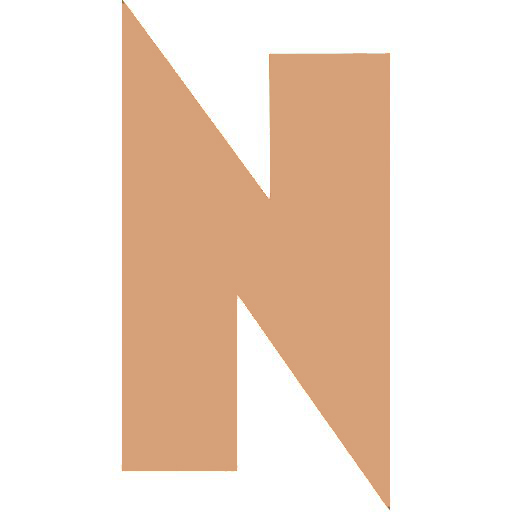 My recommendation: if you spot it, order it, because you may not get another chance. Though the species was recently at risk, Black Grouper has now been removed from the overfished list by the National Marine Fisheries Service, so now you can eat it with a clear conscience…and you really should. Cooked Oysters. The Gulf used to provide a huge percentage of the oysters consumed in the United States. 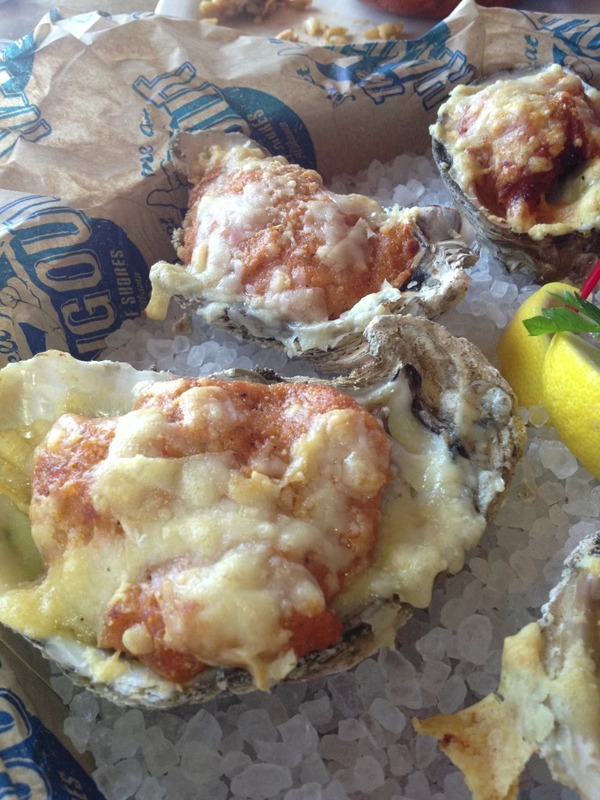 Lately, of course, many of the oysters shucked and served in Chicago come from the West and East Coasts. Even at a world-class oyster emporium like Shaw’s Crab House, which serves a daily dozen oysters from a constantly changing list, it’s rare to find Gulf oysters. There could be a lot of reasons for the lack of Gulf oysters on Chicago menus: truth be told, Gulf oysters sometimes lack the bold brininess of West Coast oysters and the subtle minerality of East Coast oysters. Gulf oysters seem to shine, however, in cooked preparations, and we found them frequently grilled with garlic and Parmesan. At Villaggio Grille (4790 Main Street, Orange Beach), they serve Devils on Horseback, fried Gulf oysters wrapped in bacon: loved ‘em. Because these oysters are harvested from local waters, they’re relatively inexpensive compared to oysters in Chicago. Lionfish. The story goes that a tanker, filled with exotic fish destined for the aquarium trade, got caught up in Hurricane Andrew and capsized. Escaping from the cargo hold, a bunch of Lionfish found a comfortable home in the Gulf reef system, one of the world’s most extensive. With no natural predators, Lionfish flourished, and they’ve started to crowd out the natural residents, like Grouper. Making the best of a bad situation, local chefs have taken to buying Lionfish captured by ecologically minded spear fishers who hope to rebalance the reef ecosystem. Turns out, Lionfish are damn tasty, with a lightly almond-like flavor and flakey, beautifully white flesh. 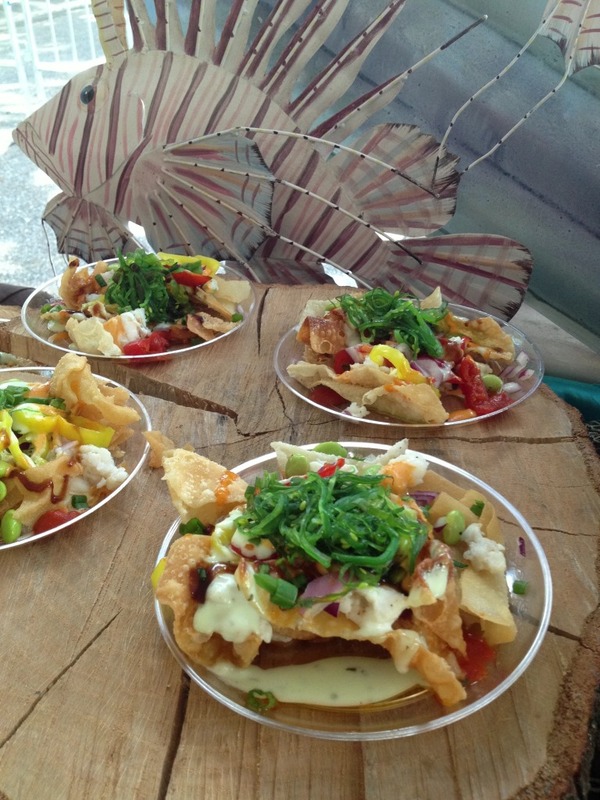 We had some excellent lionfish nachos prepared by Chef Chris Sherrill at the Alabama Festival of Flavor in Foley, Alabama. Sherrill can usually be found in the kitchen at the legendary Flora-Bama (17401 Perdido Key Drive, Perdido Key, Florida). Flora-Bama deserves special mention as one of the premier party zones on the Florida/Alabama coast. Starting out as a relatively small biker bar, Flora-Bama has grown to become a huge, roughhewn complex of drinking spaces and stages. If you want to feel the rafters shake, stick around until one of the bands, inevitably, starts playing “Sweet Home, Alabama.” And if you come in around the last full weekend in April, you can witness the annual Interstate Mullet Toss, when good ole boys hurl the fish as far as they can. The current distance record for hurled fish is over 160 feet; you’re going to want to practice for this. Orange Beach and Coastal Shores, though periodically battered by hurricanes and floods, has a huge range of rooming options. We stayed at Caribe (28103 Perdido Beach Boulevard, Orange Beach), which is a multi-building resort located within walking distance (or easy shuttle) to the Beach. 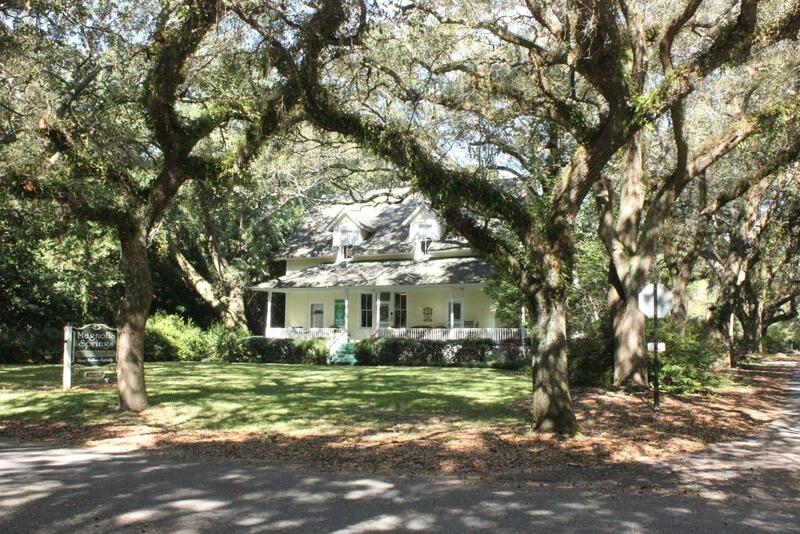 If you’re looking for something more laid-back, the Magnolia Springs Bed and Breakfast (14469 Oak Street, Magnolia Springs) is a drive from the beach and offers a comforting look back at what it must have been like to live in this area a century or more ago. To get to Orange Beach and Coastal Shores, Alabama, you can fly direct Chicago to Pensacola, Florida, and drive about ninety minutes east.